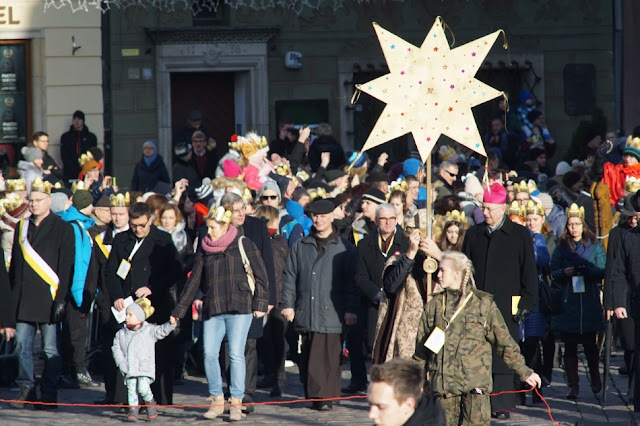 Catholic News World : #BreakingNews 1.2 Million People take part in Catholic 3 Kings Parade in Poland - with Motto "God is for everyone"
#BreakingNews 1.2 Million People take part in Catholic 3 Kings Parade in Poland - with Motto "God is for everyone"
Release: Under the motto „God is for everyone”, on January 6, in over 660 cities and towns in Poland and abroad went the March of the Three Kings. This year it was accompanied by the fundraising „Kings for the East”, the income from which will be delivered to cultural and educational institutions operating beyond the eastern border as well as in Poland for the benefit of the eastern citizens. This March of the Three Kings was one of the largest events in the year of celebrating the 100th anniversary of Poland’s regaining independence. The March’s songbook contained 14 Polish Christmas carols with their historical feature. Participants of the Warsaw March danced at the Pilsudski Square the polonaise to the carol “God is born”, which refered to the 100th anniversary of regaining independence. The President of the Republic of Poland, Andrzej Duda, took part in the Warsaw March for the third time. This year, the Three Kings were not only representatives of three continents, but also of three generations: the young, which meets God, the one, which start a family, and seniors. The biggest March of the Three Kings passed through the streets of Warsaw already for the tenth time. Traditionally, it started at Castle Square. Each of the Kings travelled differently to Bethlehem: the African King on a camel, the Asian King on a platform and the King of Europe – on a throne placed on a rickshaw, and the March was accompanied by alpacas led on a leash by children. The colorful March passed to Pilsudski Square, where the Kings bowed down and handed the gifts to the Infant Jesus. “Jesus Christ is the centre. We are going to the crib, we are going to bow down to Christ. The second feature is openness. This is an apolitical event, we invite everyone. This is a peaceful walk, full of fun. It’s a theatre, dances, music, a beautiful colourful show”, explained the idea of ​​the March its proposer Piotr Giertych. The initiative to organize street nativity plays was created in the “Żagle” school, run by the Association “Sternik”. On January 6, 2018, the March celebrated the 10th anniversary of its founding. The event was broadcast live on Polish Television.